Before him, TV sets were owned only by the few, the rich. Then, in 1948, the Tuesday-night Texaco Star Theater exploded like a shtick of nitro, with an assault of vaudeville skits, ancient gags and a man who often dressed like a woman. Suddenly everybody had to have a television  all because a middle-aged comic with manic energy and a desperate need to please was making a fool of himself, live, in America's living rooms. 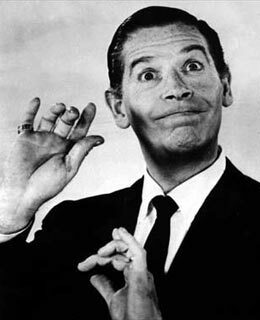 Subtle as a spray of seltzer, Berle dominated the young medium's ratings for years, at his peak winning 80% of the viewing audience. Eventually, TV grew up  anyway, it grew older  and by the mid-'50s Berle's innocent vulgarity had given way to more domestic, less frantic fare. But his ghost still haunts the tube. The Fear Factor daredevils, the Jackass prankster-masochists, the talk-show mutants who will do anything for a laugh or a shock  all are the nieces and nephews of Uncle Miltie.